A unique honour has Been accorded to Mr. Millar, of Millar Brothers, of Victoria, Australia, who for some years has been known as an enthusiastic supporter of yachting, and who recently became the owner of the English-built yacht Saide. 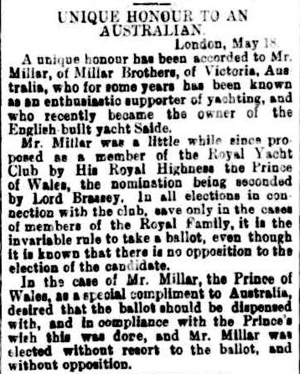 Mr. Millar was a little while since proposed as a member of the Royal Yacht Club by His Royal Highness the Prince of Wales, the nomination being seconded by Lord Brassey In all elections in connection with the club, save only in the cases of members of the Royal Family, it Is the invariable rule to take a ballot, even though it is known that there is no opposition to the election of the candidate. In the case of Mr. Millar, the Prince of Wales, as a special compliment to Australia, desired that the ballot should be dispensed with, and in compliance with the Prince's wish this was done, and Mr. Millar was elected without resort to the ballot, and without opposition.